The best time to send an email depends on your recipient. Do generalization about the time of day, or the day of the week affect how many recipients open emails? Absolutely. There are quite a few reports claiming that emails sent Monday-Friday have higher open rates. However, this largely applies to business-related content, whereas consumer content does considerably better on the weekends. When deciding the best time to send an email, it has less to do with your content and more to do with who is receiving your content. Business related content will do well before recipients go to work, but if you’re targeting college students it’s most likely to be read during class! Sending volumes are lowest Saturday and Sunday, but have the highest open rates. The most active email open time of day was between 2pm-5pm. Wednesday might be the best time to send an email. Email remarketing campaigns adjust to each recipient individually. If you’re able to send one-to-one remarketing emails, you’re guaranteed to see your open rates go through the roof. Rather than applying the same send time to every one in a specific demographic or segment, email remarketing campaigns identify the best time to send an email for each specific person. Before we discuss the best time to send an email to an individual, it’s important to understand the different circumstances that allow an individual user to be targeted. Sending remarketing emails to checkout abandoners is highly effective. Offering checkout abandoners discounts and promotions can be the motivating factor that wins the conversion to with already interested shopper. You can reconnect with these potential customers by utilizing a real-time lead collection tool. Upsellit’s PreCapture technology gathers email information, without requiring a submit page. Say you run a brick and mortar store: you recognize a shopper who had previously visited and you let them know about current promotions and deals. This would strengthen your relationship with the customer. Treat your E-commerce relationship with the same kindness! Recognizing and emailing a returning shopper who left without purchasing can strengthen trust while reinforcing your brand. Upsellit’s Visitor ID® technology will identify this returning shopper who provided an email address in the past. Upon abandonment, the shopper will receive personalized email messages with targeted incentives and relevant information. Establishing a connection in an email relationship with your customer is beneficial and will increase conversions. There is no better potential conversion than somebody that knows and loves your brand. Targeting these customers is highly beneficial, keeping your brand top of mind and connected with your customer. 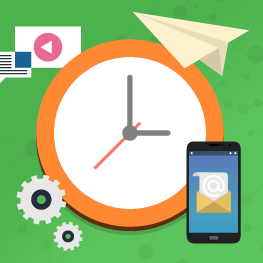 The best time to send your first remarketing email is within the first hour. Some marketers say, ‘the sooner the better,’ however, if your user is still browsing – and wants to return to your website – a premature email can do more harm than good. Studies show that 90% of ecommerce leads go stale after the first hour. A remarketing email sent within an hour of abandonment is optimal; the user is likely still browsing online, maybe doing some price comparison with your competitors, so reaching out to this potential customer while they are still considering making a purchase will reap strong rewards. If your first email message doesn’t land a conversion, it doesn’t hurt to try again. The best time to send a second email is 24 or 48 hours after abandonment. 72% of buyers who do convert after abandoning their cart, do so after 24 hours. Sending your second remarketing email exactly 24 or 48 hours after abandonment aligns with a customer’s browsing pattern. Targeting the customer around the same time that they had been online, viewing your product, the day before is excellent. You know that they were browsing online that same time- so likely, a promotion sent at the same time of day will trigger a conversion response. The second remarketing email is a great time to include incentives. Including incentives earlier than this can nurture a sense of discount expectancy and is more likely to give something away before it’s really needed. The last email of a typical 3 email series is optimally sent 72 or 96 hours after the initial abandon. This time frame is enough time – but not too much time – to remind the potential customer of your brand. Escalating incentives is strongly advised here; reel your customer back in with an exclusive offer! Time-sensitive and exclusive language is a strong strategy for the last email of a remarketing email series. This is the last chance (final opportunity!) for your potential customer to get this great, exclusive deal. While exceeding 3 remarketing emails isn’t for everyone, some marketers suggest sending an email up to SIX weeks after abandonment! Different products have different purchase cycles; it’s important to know who your audience is, but even more so if you are going to send more than three emails. However, with remarketing emails, the best time to send an email is when the customer is most interested. A dynamically tailored series of emails starting within an hour after abandonment and continues in 24 hour increments is the strongest approach. It could be any day or time of the week: the series of emails will be triggered by that customer’s personal browsing habits. If you are interested and want to learn more about utilizing technology and creative marketing ideas to increase conversions, contact Upsellit!